The BRR has devoted a slew of the blog's space towards exposing the arbitrary and largely hypocritical nature of Bleacher Report's standards for "evaluating" its writing staff. On a website staffed with 1100 writers, 75% of whom are unpaid while the majority of the remaining 25% are desperately trying to achieve full-time status with the website, an orderly system is vital. It does not even matter how robotic that system is. For the site's "talent," a more structured program is to their advantage. It will inevitably hurt the creative quality of the content and continue to be a miserable place for consumers, but at least Bleacher Report can swiftly put an end to the labor issues that have plagued the site's reputation throughout its existence. Unfortunately, though, B/R's new e-book — a 56-page e-epic that successfully flows back and forth between concepts taught in 7th grade writing/grammar and Intro to Journalism classes while tying them back into B/R's mechanistic methods — only serves as a nod of confirmation towards what we already knew about Bleacher Report. The book does not provide a person with any special insight on how to improve his/her writing as a journalist, school student, or short-story fiction writer. Instead, the e-epic puts on the façade of being the be-all and end-all "objective" guide for "succeeding" as a Bleacher Report writer, even though Kaufman et al. cover their bases by page 5 and completely back off from the premise of the insufferably boring and trivial 51 pages that follow it. Bleacher Report has been raising its quality standards for about three years now, and we plan to continue doing so. We want as many writers as possible to be able to stay with us. If you want to be successful at Bleacher Report, mastering the concepts in Playbook is a prerequisite, but it's only a first step. Once you've built that foundation—which, again, will benefit you wherever you go—your long-term prospects will depend on the kind of nuanced intangibles that are better judged by more subjective methods. Since the Kaufman et al. 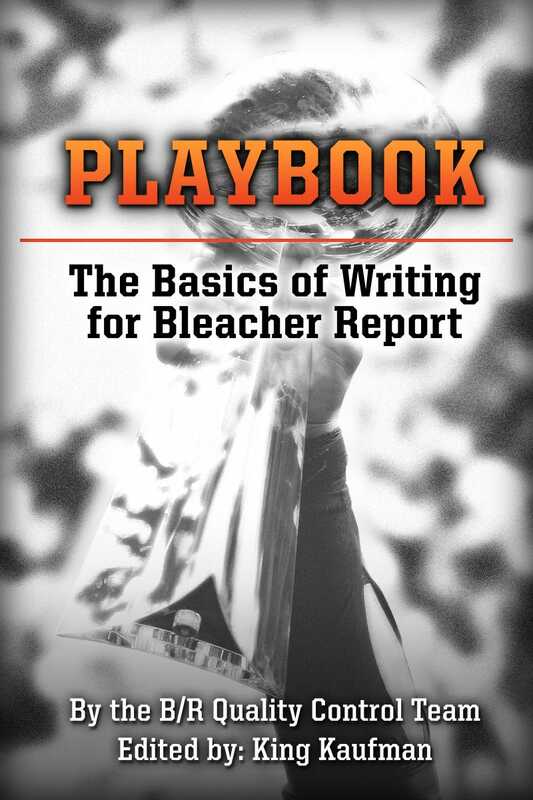 infomercial/e-book, Playbook: The Basics of Writing for Bleacher Report, is destined to be read in full by only me, its authors, and Bryan Goldberg, I've excerpted a few of its passages below for your reading displeasure. If you feel like further rotting your brain, download the e-book in its entirety here. "Objective" might sound like a strange word to use because we all know that writing is an art form. But just as we can evaluate whether a musician hits the notes correctly or is playing in the right key, there are some things within the art of sportswriting that we can judge objectively. ... This isn't just theory. We've tested it. If the main purpose of an article is to make a subjective argument, the story is classified and reviewed as an Argumentative Article. The headlines for Argumentative Articles typically include words or phrases like "should," "must" and "reasons that." If a piece makes a subjective argument, it's an Argumentative Article, even if it seems to fit another category. A piece that makes a subjective argument about a news event will be evaluated as an Argumentative Article rather than as a News Report. An example of such a story would be one with a headline like "Why Team X Was Wrong to Trade Player Y." Including the primary keyword... You might be thinking this primary keyword rule is all about search-engine optimization. SEO is important: Search algorithms favor articles with keywords in the first paragraph. But that's not the main issue here. What we're concerned about is appealing to readers by getting right to the point—and "the point" is always going to include an explicit reference to the most important figure, team or event in your story. That is, the primary keyword. Evaluators compare the analysis in a News Report to the prevailing coverage by running a Google News search for comparable articles—about the same news item—published in the same time period. If more than three of the comparable articles advertise similar analysis, the evaluated article flunks the "creative" test, but anything less is good enough to pass muster. Sure, this is a bit of a blunt object of a tool for evaluating creativity, but combined with the plausibility requirement [see above]... it's a pretty good way of identifying creative, original analysis. In a Bleacher Report Ranked List, the criteria used to rank the elements in the list should be laid out explicitly within the first two slides in a slideshow, or within the first 100 words in a standard article. The criteria should be announced all together and in their entirety. Once laid out, those ranking criteria must be logical. The test for that: If the criteria were fulfilled, would that result in ideal candidates at the top of the list? If your criteria for greatest quarterback is most yards per game in a career, you end up with Matthew Stafford at No. 1, Carson Palmer at No. 10 and Joe Montana at No. 32. Would that pass the sniff test for you? Yes, of course, the sniff test... An objectively true method of scientific inquiry that is more than theory because we've tested it! We define "breaking news" as any event occurring or becoming known within the previous 24 hours. As with stats, widely available breaking news need not be attributed, but it should be hyperlinked. You don't have to write: "The Phillies beat the Mets last night, according to MLB.com," but you should link it to a conventional game recap. The key thing to think about here is that if we know something because some reporter or media outlet has reported it, and the news is less than 24 hours old, you need to attribute it. The fact that Bleacher Report does game recaps of their own but discredits themselves as an official source should tell you most of what you need to know about Bleacher Report. The Attribution and Hyperlink criteria may seem complicated and specific, but you get about 95 percent of the way to living up to them by remembering a simple dictum that the Bleacher Report Blog calls Lennay's Law: Tell us what you know is true, and tell us how you know it. Clichés: Bleacher Report has a "blacklist" of 20 clichés. They're listed here. They include such chestnuts as "Do or die," "Are you ready for some [something]?" and "When push comes to shove." The hunt for clichés is a good example of what an objective evaluation system can and can't do. Almost every cliché begins life as a clever turn of phrase, and it takes a perceptive, human editor to spot that sometimes-subtle transformation and identify every one of those witticisms that has soured from overuse. And, as we all know, a person would never find such clichéd and stale phrases on Bleacher Report. Yeah, blacklist; you go, blacklist! Vague headline: "The Best of the Best in Today's NBA"
Specific headline: "Kobe Bryant vs. LeBron James: Who's the Bigger Star?" Bland headline: "NBA: LeBron James Signs With the Miami Heat"
Clickable headline: "LeBron James Signing Makes the Miami Heat the Team to Beat in the NBA"